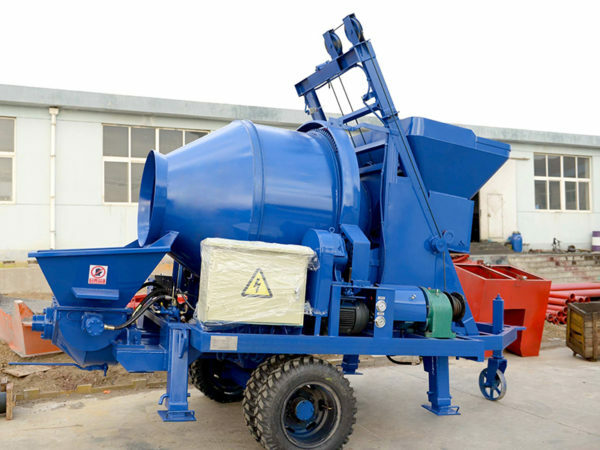 Small concrete mixer and pump plays an important role in the booming construction market. In recent years, with the development of the economy, the speed of the construction industry is growing faster and faster. More and more clients want to buy small concrete pump. The small concrete pump is a kind of construction machinery that conveys the concrete through the pipeline, then pours concrete to the construction surface through horizontal and vertical transportation. Its working principle is that the motor drives the oil pump to produce the pressure oil, and the pressure oil drives the cylinder, which makes the piston rod of the cylinder drives the piston to push the concrete into the conveying pipe. By the S valve and the main oil cylinder, the concrete is continuously sucked from the concrete hopper and is transported to the pouring site through the pipeline. Our JBS30 small concrete mixer with pump was successfully exported to Ethiopia. Before exporting, our customers from Ethiopia visited our factory and our Aimix office. During communicating with our sales manager, our customers is satisfied for our company. Therefore, they decided to cooperate with us. 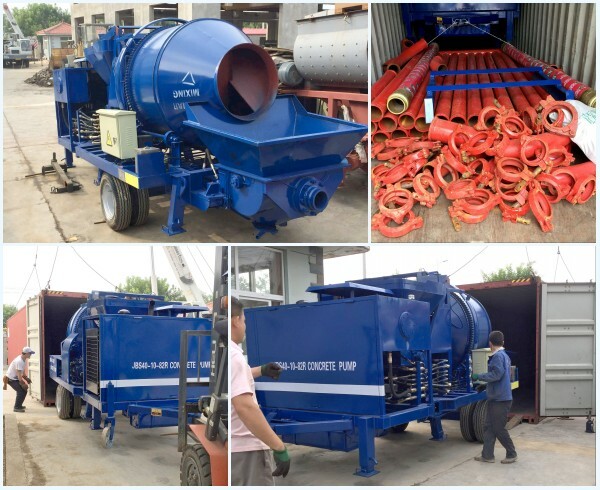 As a professional and reliable company, we not only provide you with small concrete mixer with pump, but also concrete mixer pump for sale, concrete trailer pump, concrete boom pump for sale, concrete line pump, truck mounted concrete pump and so on. If you choose us, we believe that you can find a suitable machine. Good news! Aimix Group JB40R small concrete mixer with pump for sale was smoothly send to Malaysia. 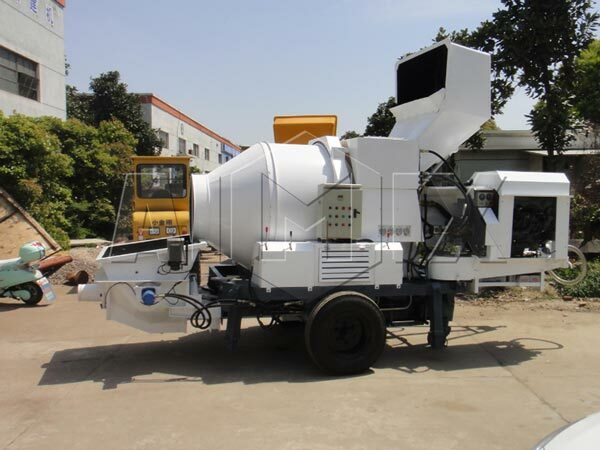 Under the help of our engineers, small concrete mixer with pump for sale successfully installed and worked normally. At the same time, our engineers help our customers train their operators. Since our company founded, our machine has won good reputation by our customers because of its stable performance, high quality and high working efficiency. 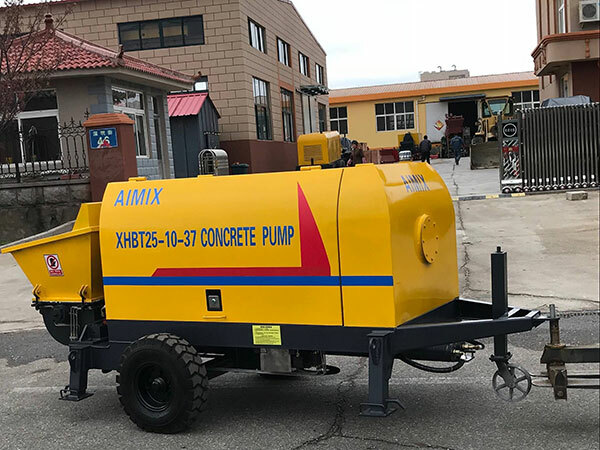 Aimix Group not only provide you with high-quality equipment, but also affordable small concrete pump price and thoughtful service. According to the form of distribution valve, small concrete mixer with pumps can be divided into gate valve small concrete mixer and pump and S-valve small concrete mixer and pump. Due to its high quality, high availability and easy cleaning, S-valve is often used in the construction of high-rise buildings. 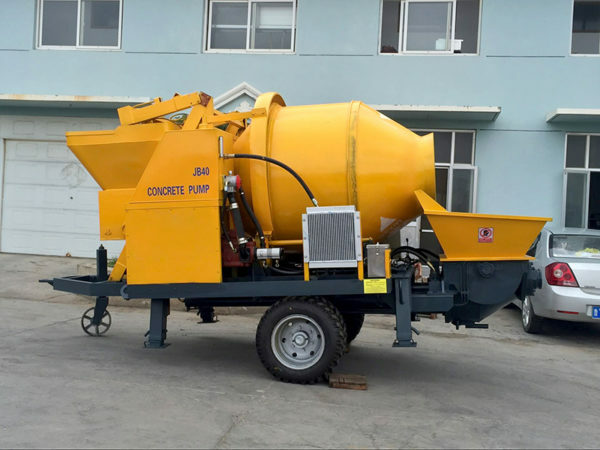 According to the dynamic system, there are two types of small concrete pump, electric small concrete mixer pump and diesel small concrete mixer pump. The electrical control system of electric small concrete pump has been greatly improved, which reach a high level of automation. It adopts advanced hydraulic pump that has the characteristic of high reliability and safety. The lubrication system can ensure sufficient oil feeding with high efficiency and energy saving. It is easy to operate. 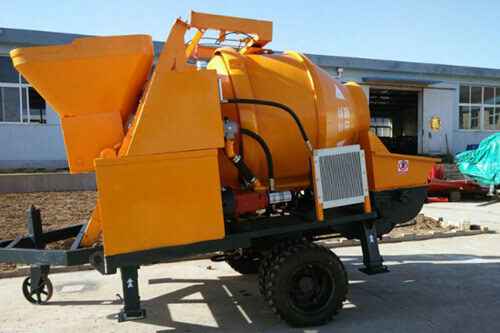 The electric concrete pump mixer can make uniform concrete and pump concrete smoothly along the pipeline with good performance. 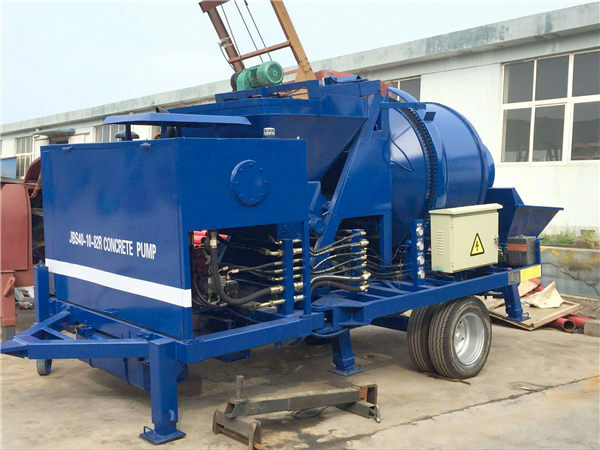 The diesel small concrete mixer and pump is well-received in the areas which lack of electricity. Besides, mixing and pumping can simplify the working procedure, which can improve working efficiency. The hydraulic system has optimized S-tube valve to ensure excellent concrete pumping ability, high pumping speed and less congestion. 1. S-valve: Small concrete pump adopts advanced s-valve to reverse with no congestion, which can transport mortar concrete and commercial mortar concrete. The S-valve can compensate wear clearance automatically with good sealing performance. 2. Anti-pumping function: It has anti-pumping function, which can timely troubleshoot the non-working pipes and stop work to wait for concrete in a short time. 3. Glass plates and cutting rings: They all use wear-resisting hardness alloy materials, which can increase its service life. The longest life of glass plates can reach over 30 thousand cube. 4. High pressure in outlet: That can satisfy the pumping needs of high-rise building and remote distance construction. 5. Lubrication system: It adopts automatic centralized lubrication system, which can ensure efficient lubrication in the working process. 6. Air-cooling system: The hydraulic oil cooling adopts air-cooling system, which is convenient to use with good cooling effect. Moreover, it is not easy to pollute the hydraulic oil. 7. 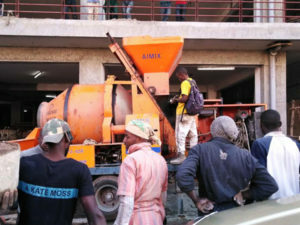 Displacement: Small concrete pump with mixer can change the displacement manually, which can meet the different discharging speed demands of users. 8. Wireless control: The equipment uses wireless remote control technology, improving the control distance. The product is easy to operate with humanization design. 9. Anti-wearing concrete cylinder: The use of concrete cylinder increases the lifespan of concrete pump and reduces the cost of maintenance. 10. Main oil cylinder: The main oil cylinder plate chromium in inner bore, the new technology can solve the problems of main oil cylinder damage due to dirty oil. 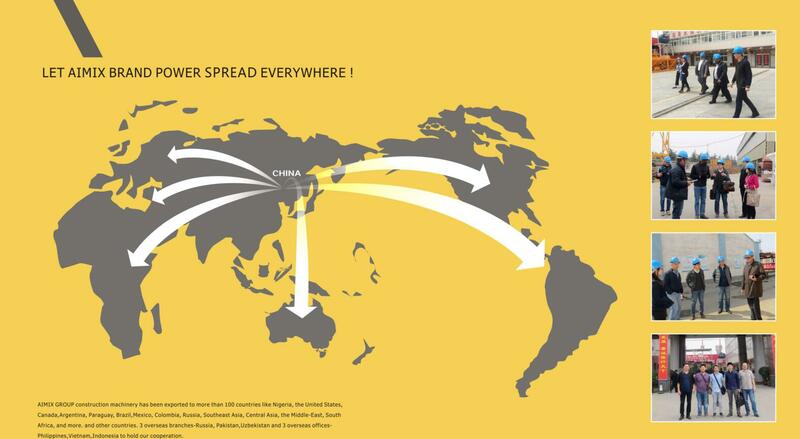 With rich experience in manufacturing and exporting, our construction machine has been transported to more than 80 countries all over the world, such as, Malaysia, Ethiopia, Pakistan, Philippines, the United States, Australia, Burma, Uzbekistan, Vietnam and so on. 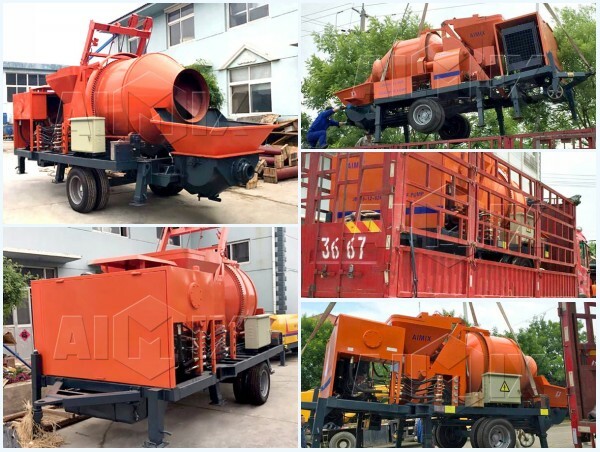 As the small concrete pump supplier, we can provide customers not only high quality concrete pump mixer for sale with reasonable price, but also reliable services. Our group has established for more than 30 years, and we are working on design, production and marketing. Our concept is customer first. Once you place an order, we will serve you heart and soul. Furthermore, we will provide you pre-sale service, on-purchase service and after-sale service. Trust us like the other old customers do, we firmly believe that our machine will bring you huge gains. If you need a concrete mixer and pump, please don’t hesitate to contact us. In the process of the conveying concrete, cleaning of concrete pump is also an essential and important step after pumping. A good cleaning method can not only clean the conveying pipeline, but also transport all the concrete in the pipe to the pouring place, which not only does not waste concrete, but also is economical and environmental. There are three kinds of washing methods that are usually used in S-valve small-sized concrete pump. These are directly pumping water method, removing the tubes method and adding the piston method. 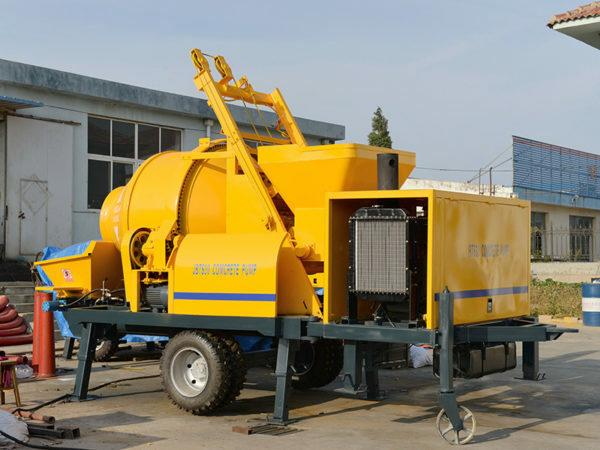 The above three kinds of small concrete pump with mixer washing methods have their own advantages and disadvantages, among which the most reliable method is the method of removing the tubes, and the most simplest method is the method of adding the piston. If the conveying distance is relatively short, the directly pumping water method is also a good choice. You can choose the specific cleaning methods based on the actual situation of construction, in short, to achieve both effective and economic. If you have any other questions, please contact us now.